As long as local and other zoning ordinances permit business use, any public or private facility can be used for most general types of businesses. Because home-based businesses are operated in properties zoned for residential use and not commercial use, they are often subject to many restrictions on the type of business that can be operated, as well as subject to severe limitations and restrictions on conducting face-to-face business from a home-based office. Two main considerations to focus on when deciding on the right type of space to lease for your business are the location and the type of lease being offered. A mall might offer a great location for a retail business but you will likely have to share a portion of your profits with your landlord in addition to paying a base rent. Leasing industrial or business park space is an alternative worth considering for retail businesses because the rents are cheaper and it is unlikely you will have to share your profits. Commercial real estate can be land, property, or facilities that are either zoned for or used exclusively for business purposes. In most cases, people cannot live in a building zoned for commercial business purposes and many local ordinances may also have restrictions on what and how commercial property is used. And, to make matters even more limiting, local community and homeowners associations and individual landlords may have their own restrictions. It is extremely important when looking for commercial properties to lease that you are completely honest with realtors and landlords about what you plan to do with the property and any future plans you may have to improve the property or expand your business. For example, if you are planning on setting up a retail shop or place of business where you expect a lot of customers coming and going throughout the day you need to let the landlord know in advance. If you don't and suddenly turn and office into a thrift store you and your business might end up on the street for breaching the lease (and you may still be financially liable for the rent until the place is leased again.) It pays to take your time, think about what you want, and ask questions about restrictions. Here are some of the most common types of properties you can lease and little about each one. A business park is a group of buildings designed for general and light-industrial use business purposes. Business park rents are often cheaper than retail properties and comparable to industrial park rents. Many doctors and other service professionals lease space in business parks. This type of commercial property consists of buildings divided into units or spaces that are often warehouses or other large, unfinished spaces. Industrial parks are usually zoned for heavy-industrial purposes but are often also used for other types of businesses. Industrial park spaces can be used for manufacturing and other heavy industrial purposes, like warehouses, can be converted into more traditional office spaces, or serve a combination of business uses. Industrial spaces that have store-front window exposure, are now also used by many small retail businesses just getting started. Some industrial parks have become so attractive that on the surface they are hard to distinguish from business parks except they typically have large, garage-style doors for access. 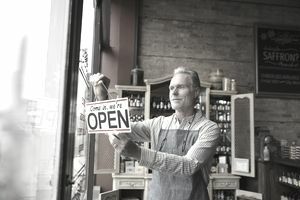 A determined business owner can usually find industrial leases that have been renovated or built-out by previous tenants into office or retail space. These semi-upscale spaces still often cost far less to lease than other types of commercial properties. This type of property includes malls, strip malls, and other facilities suitable for store-front types of businesses. In addition to facilities designed either specifically or exclusively for retail businesses, many retail business owners also lease units in industrial parks and business parks.